Ooh gosh the pea boy is really cute. Sleeping soundly with his snore. Lia, saya salut bener nih ama ide2 briliantnya, jempol deh! Pea boy is so cute..jangan bosen bosen ya.. Always love your idea and creation! @sheri fujihara chen : Yes, that is a tiny pea pick. I almost forgot that I have the veggie picks set. This is what happened when you collecting too much stuffs LOL ... Thanks a lot Sheri! @tatabonita : Can we change weather? I will send the sun right away ;) Thanks a lot Ta! Have a great day! @Bobo : Thanks a lot! @Lyn : I don't celebrate Hari Raya because I'm Christian. But love to get the benefit to have 1 week holiday though hehehe ... :D Thanks a lot Lyn for your kind comment! The pea boy is cute and that blanket is totally precious! What a great bento :) Teaching Big A to sew will be fun! A-chan was learning to sew a little recently - she had more patience that I expected. 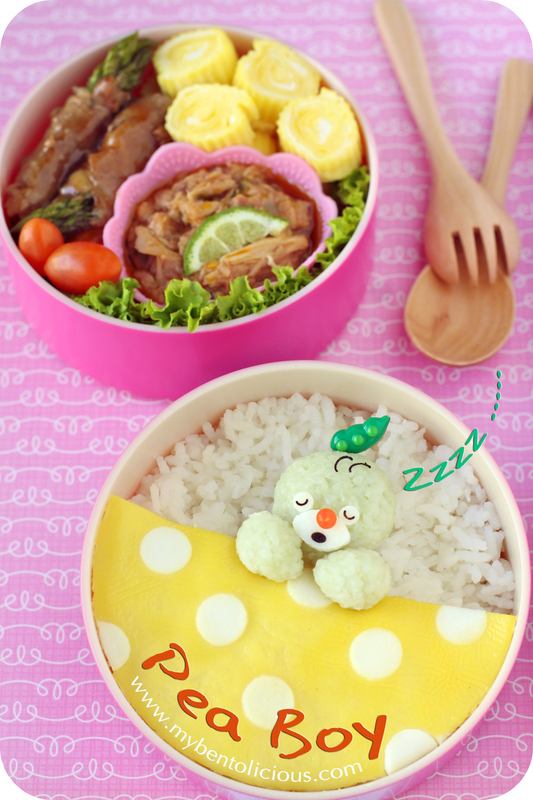 Lia, I love this bento. Pea Boy is so cute love the pea pick! Enjoy your time with your family! I should teach my daughter how to sew on a button too. Funny how we just don't teach sewing much anymore! the pea boy sleep so tight! @Tiffany Yang : Thanks a lot Tiffany!